All photos are by Juris Kalniņš and are used with permission from Live Riga. 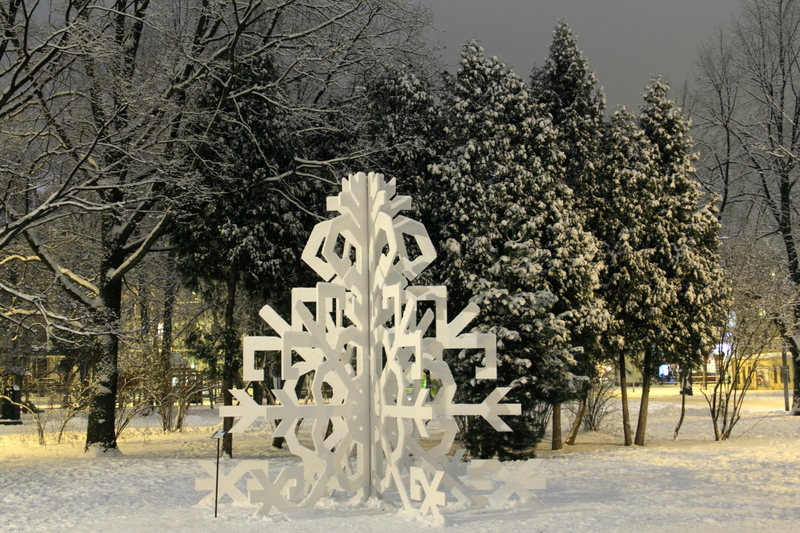 The Christmas Tree Trail (official website) is a fresh interpretation of a very old tradition. 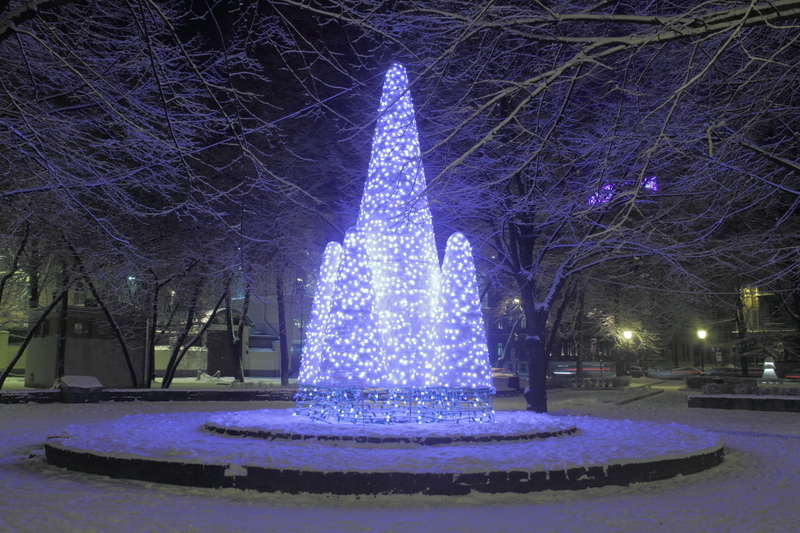 Residents of Latvia have been decorating Christmas Trees for over 500 years. 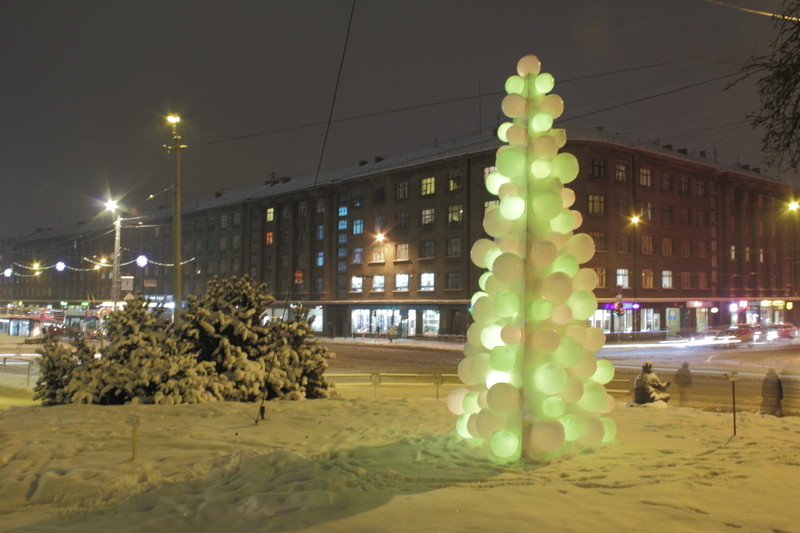 In 2010, Riga organized a exhibit of avant garde art trees created by local artists and students from the Latvia Academy of Arts. The event was so popular that it has now become an annual event! Some of the most popular trees are brought back from year to year and shown alongside new pieces. 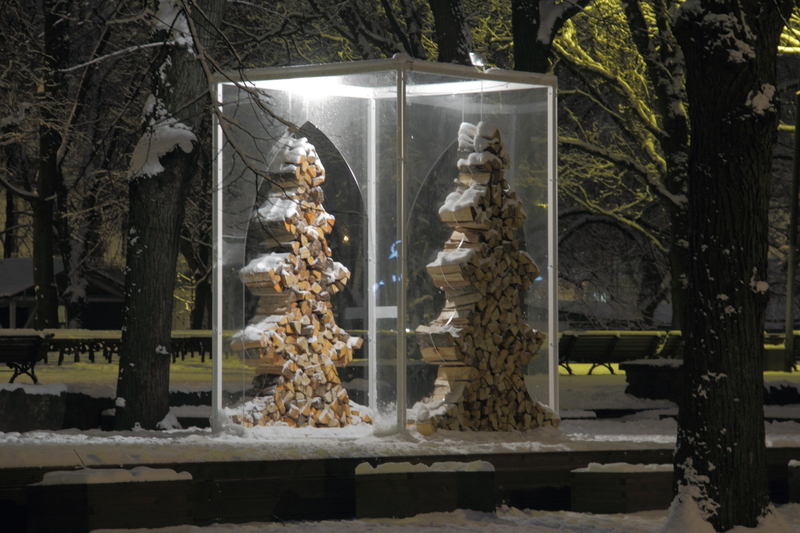 For example, “Who Brought the Christmas Tree” by Iveta Heinacka and Laura Bistrakova (shown above) is back for its second year. 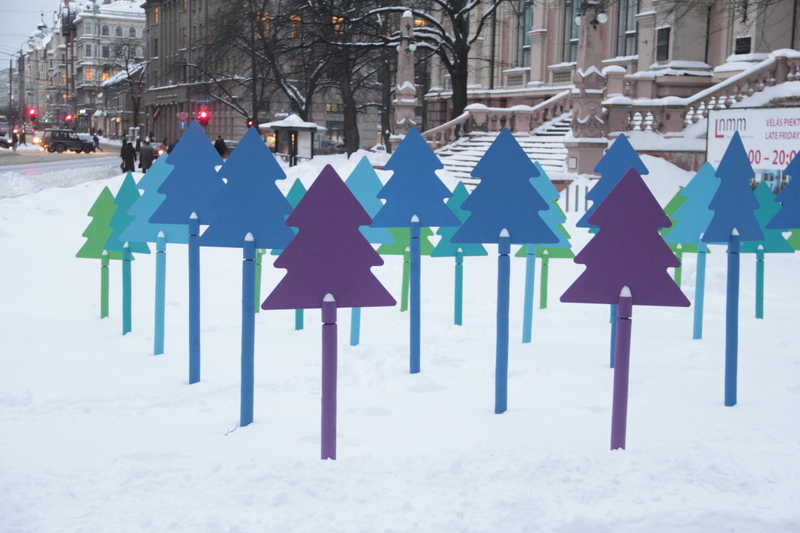 For 2013, there are 65 trees in total on display! Click here to see a Riga city map highlighting all the tree locations. 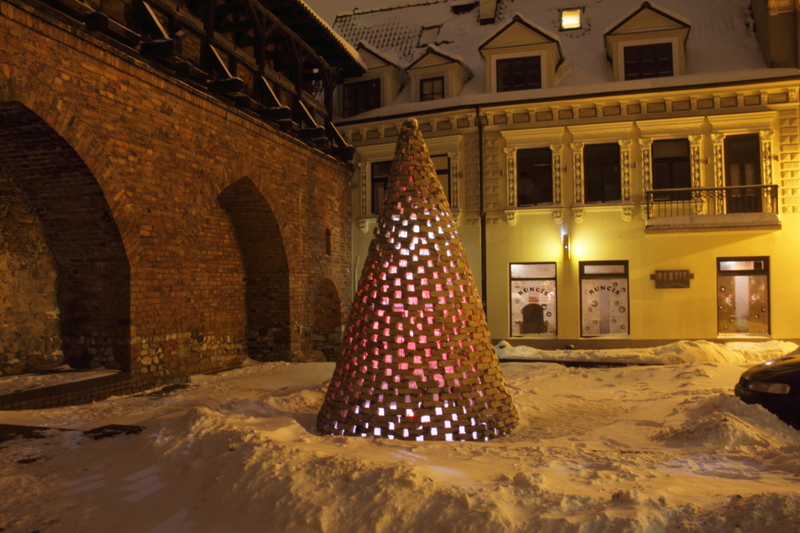 The clay bricks of GADSKĀRTU EGLE (Yearly Christmas Tree) by Māra Maižele and Uģis Bērziņš blend into the architecture of Riga’s old town. Recognize this tree? It’s based on the game Tetris! 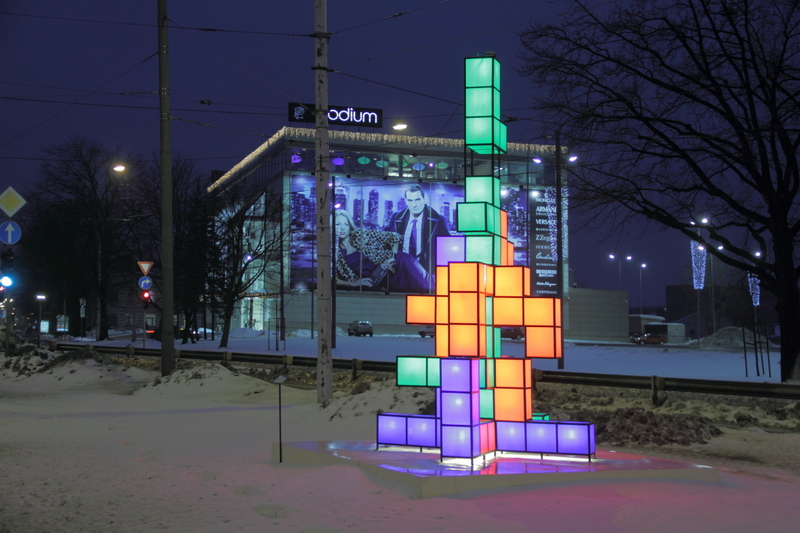 EGLE TETRIS (Tetris Tree) by Lauris Vītoliņš. The exhibit encourages creativity and supports modern artists. I’m excited to see a city that so embraces public art and sponsors amazing events like this! It shouldn’t be a surprise then that Riga was selected to be the 2014 European Capital of Culture! 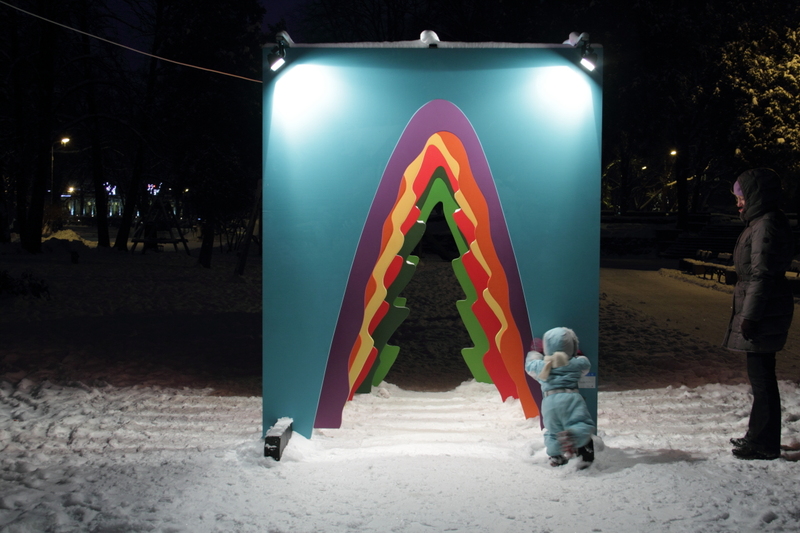 This year long celebration will feature exhibits, concerts and festivals to showcase the historic art treasures of Riga and its thriving art community. For this and many other reasons, Riga has been showing up on the 2014 recommended travel lists (like National Geographic and Lonely Planet) and is certainly on my radar. 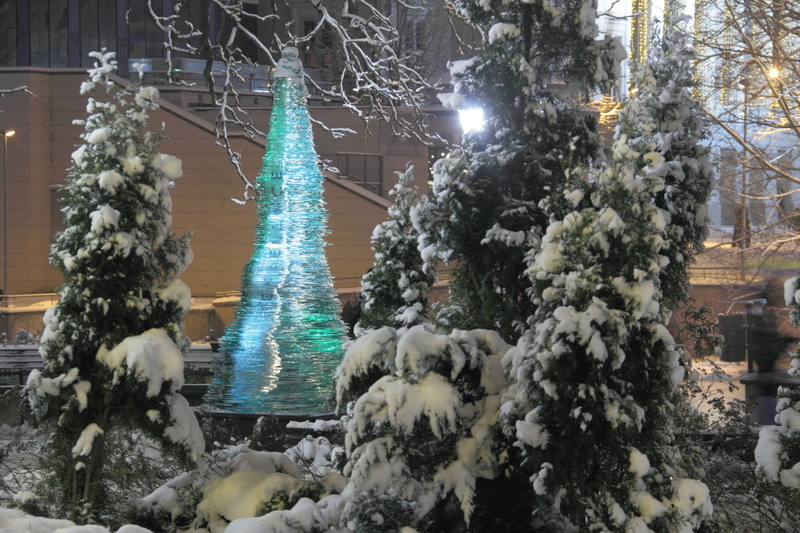 I may not make it in time to see these amazing Christmas Trees, but I hope to see Riga soon! 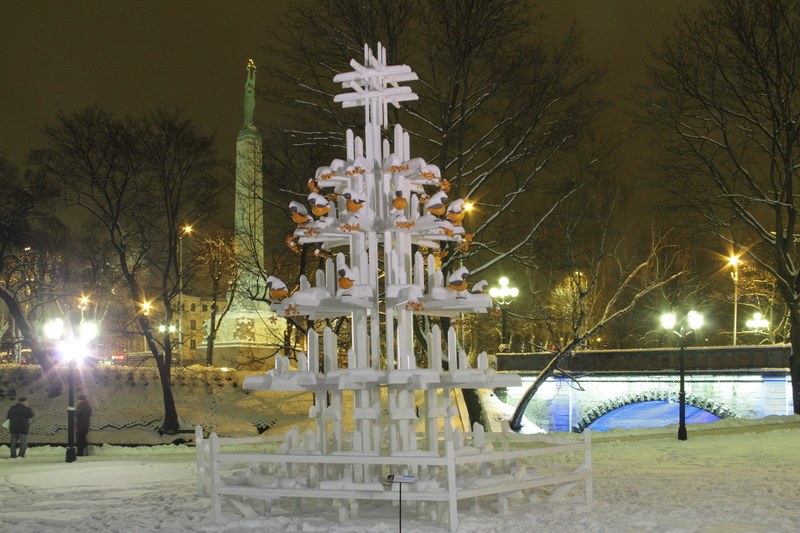 The KOKA EGLE (Wood Tree) by Jānis Ezers and Visvaldis Asaris. You can see the soaring Freedom Monument in the background. 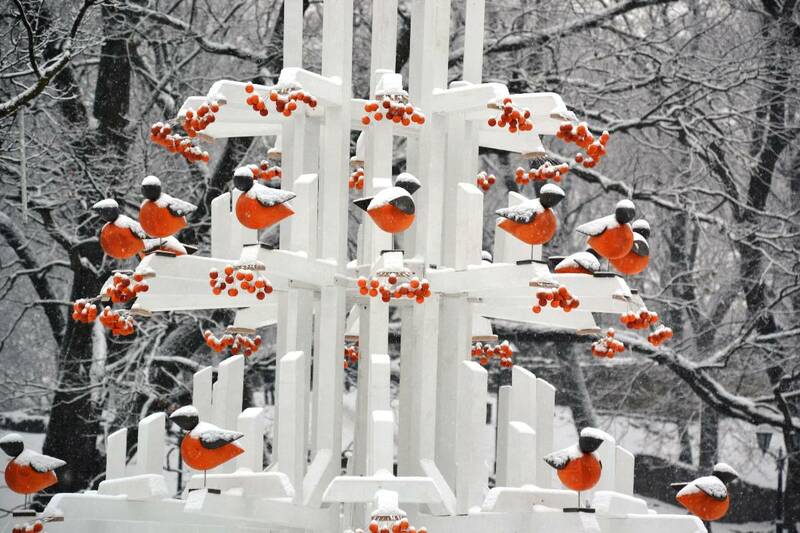 Lovely detail from 2012 of the snow covered birds and berries from KOKA EGLE (Wood Tree) by Jānis Ezers and Visvaldis Asaris. 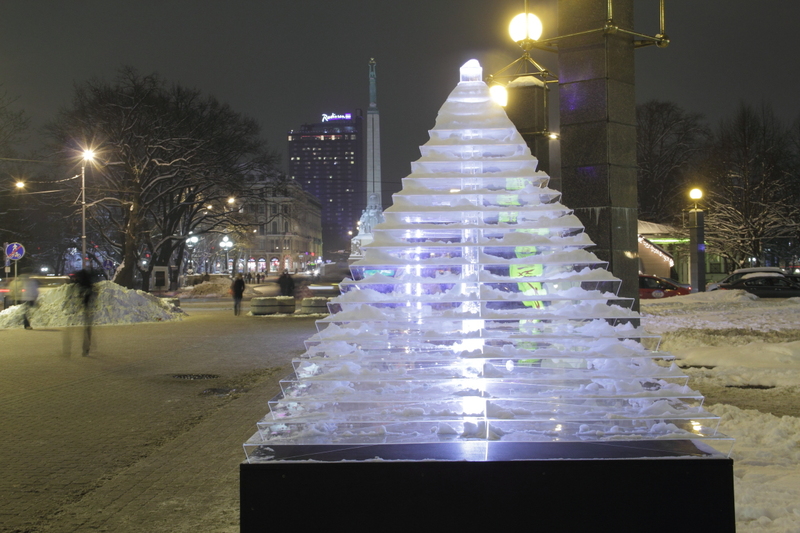 STIKLA EGLE (Tree of Glass) by Ernests Vītiņš and Ernests Ronis. VAI TU JUTI EGLU SPEKU (Do You Feel the Tree Force) by Iveta Heinacka, Laura Bistrakova, and Marta Ģi. So what do you think? Which is your favorite Christmas Tree from the festival? UPDATED! Click here to see the new trees introduced for 2014! I can’t wait to see this beautiful display in person!! When are you moving? 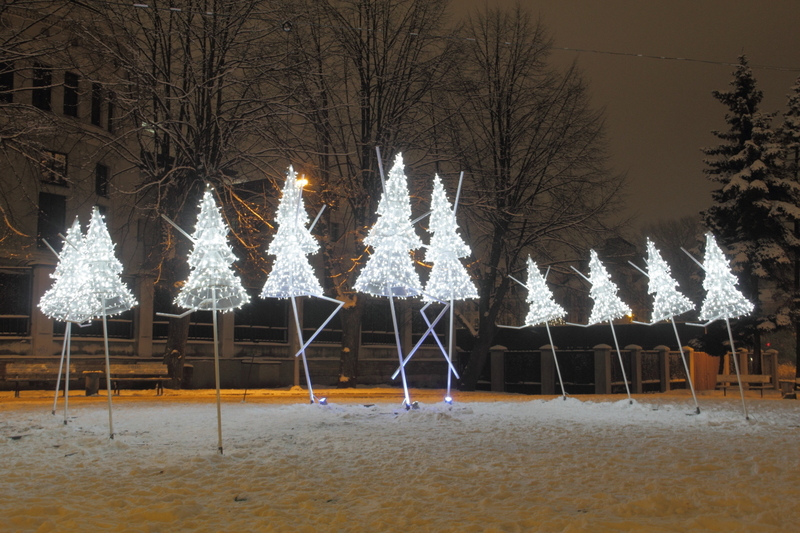 The trees will be up til mid-Jan. I’m so excited that you are going to see and explore Riga! This is a great year to be there. Take lots of pictures and have a great time! Me too! 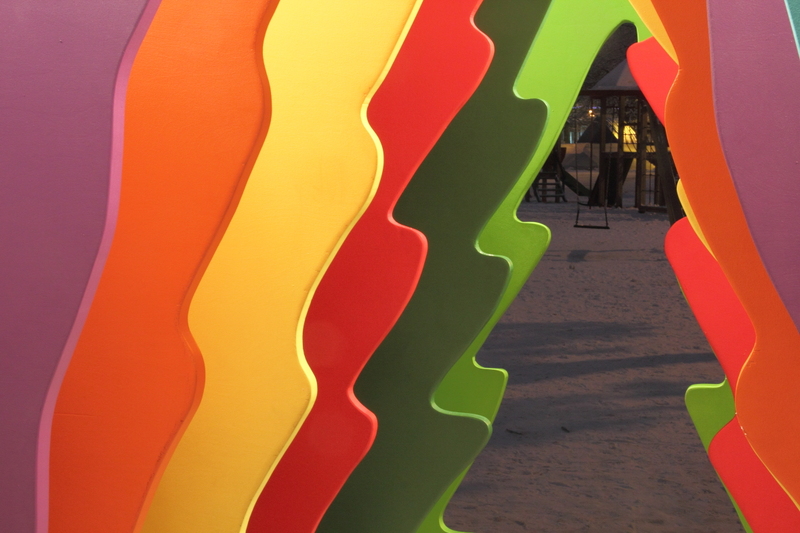 Why don’t we have more year-round public art like this?